The Frozen Passion! Grease Blizzard! Chill Chill Chill Chill! 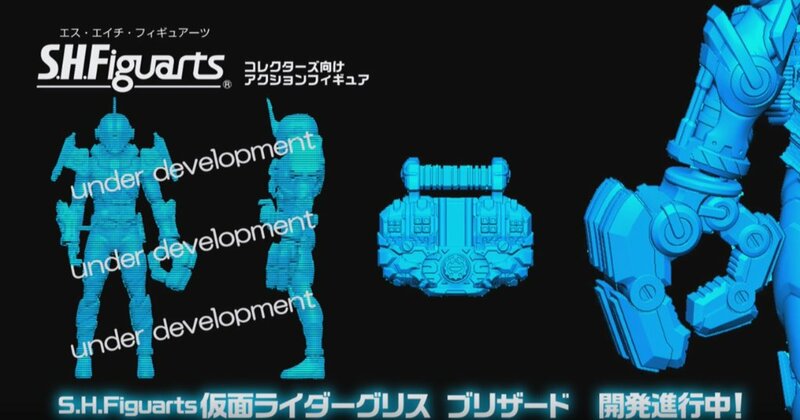 Kamen Rider Build may now be over but Bandai Tamashii Nations clearly still have plenty of plans for the series, as is evident with the reveal that an S.H. Figuarts Kamen Rider Grease Blizzard is in the works! The final form of Kazumi Sawatari is currently under development, with the only information available at this time being a 3D mock up which also highlights some of the form’s more significant features. Stay tuned to Tokunation for more information on S.H. Figuarts Kamen Rider Grease Blizzard as it arrives! Kazumi's final form will be joining the S.H. Figuarts line in the near future! More information on this release as it comes. Cool, but I would rather like to see Evol and Mad Rogue at ths point. I guess, since they already have the Grease mold, this is a pretty easy mold for them to put out. Just give him a big robo-glove and Cross-Z's belt, and there ya go. Sounds nice, although wasn't there an issue with original Grease mold being too thin? I'm curious to see if they fixed that in this run. This is fantastic. I love it when last second additions like this form get the figure treatment. Chaser Mach was just the same and the whole debut of Blizzard reminded me of it so much. So happy to see Kazumin getting some love!